I quit my job! I gave 7 weeks notice and it has flown by, I now only have 3 more days of work and I am done. No I don't have another job to go to, not that I haven't had offers, but I want to take some time de-cluttering my head and think about what I really want to do with my life. I was 99% decided on resigning and then I had a sudden moment of inspiration and I just emailed off my resignation. I haven't even had a moment of doubt that it was the right thing to do. Intuition says it's what I needed to do. Who knows, I may even find the time to learn Italian and take a trip over there! Am being seduced by a consultancy firm at the moment. Whilst the people who work there are of top quality and it's kinda like working with the best of the best, I just don't know if I am ready for the power suit and I wasn't blessed with glossy thick perfect hair so I'm not sure whether I can pull off the look. It's all under the table, the partner I'm friends with doesn't want to be seen to be poaching me so we meet in dim coffee shops. Yesterday he told me I was a 'known person of substance'. I sure hope he was referring to my work and not my weight. This time he actually asked me directly if I would like to work for his company. They don't take just anyone so it is flattering but they want me to go permanent and I just want to go contracting and have a couple of flings before settling down with another company. Well boy did that get a response, I've never had so many phone calls from HR, I ignored them as I want them to respond in writing. I got pulled into a manager's office and was told they had been looking into it and they had found an error but they weren't going to tell me anything till a correction was approved. I felt like I was being told off for being a petulant child. So I'm gonna get the rest of my bonus but I'm still planning on quitting on January 4th. I've got my permanent job offers to fall back on if I can't arrange contract work. Guess who's getting a new car? Me, me, me!!! I just have to wait 2 months for it to be delivered. I've never had a new car before. I'm giving my car to my mum when I get the new one and she is very happy with the price (that would be $0). Just doesn't feel right to take money from my mum when she needs the money way more than I do. It's still in pretty good condition so she's as excited about getting my old car as I am about getting my new car. So what do I do with these? 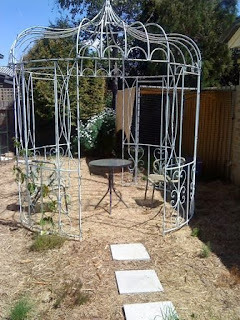 I've got a 4 day weekend, had planned to garden today but it's already almost 30 degrees (86 Fahrenheit) with a predicted top of 30 and its only midday, no clouds in the sky so I think it may exceed the forecast. Plus UV levels are rated as very high so best to keep it to indoor activities only today. Think I might have to go shopping. It's Halloween today which is not really celebrated in Australia the way it is in America. Sometimes you get a bunch of kids trick or treating but most of the time you don't. 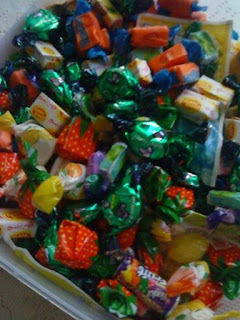 So I'm not sure if I should buy lollies just in case, I could end with a huge pile of lollies and no one to eat them but me. 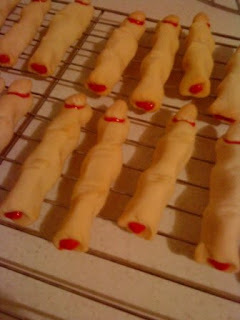 I made a batch of witches fingers and took them to work yesterday. Try carrying a see through box of fingers to work, lots of stares on the train, the woman sitting next to me told me they were gorgeous and everyone at work was quite impressed. Took a couple of photos of my backyard to compare to what it was when I moved in. It's still a work in progress. I have been contemplating ditching my blog. I think I'm running out of things to say and even I am over hearing me complain about work. I think I might just switch to facebook, yeah I know, I resisted it and now I find that I actually like it and it's actually refreshing being able to say things as me. Of course I can't complain about work or my mother (I really shouldn't anyway) but I think having to be more positive in my comments will help me be more positive. In short, I'm over complaining... if you're interested in being a facebook friend, let me know. I'm going to deblog in a couple of days. Went and saw Julie and Julia this afternoon (caught up with my work pretty quickly with no interruptions). I thought it was a nice enough movie, not great but not bad. 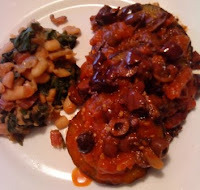 I had an eggplant and some rainbow chard that I had to use up so tonight I made eggplant cutlets with tomato sauce and olives (from Vegan Italiano) and cooked the chard with garlic, olive oil, white beans and a little salt, tasted pretty good. Well tasted much better than it photographed. 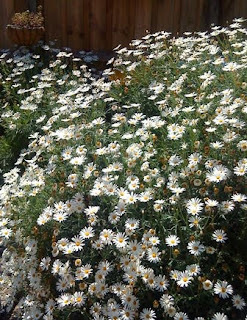 30 something Aussie girl living in the outer south eastern suburbs of Melbourne. I work in I.T. 15 minute Italian - the first two lessons over and over and over again.